MADRAS HIGH COURT Before :- P.R. Shivakumar, J.
Cri. R.C. No. 885 of 2010. D/d. 11.3.2011. For the Petitioner :- I. Subramaniam, Senior Counsel, Prakash Goklaney, Advocate. For the Respondent :- Amit Desai and P.H. Aravind Pandian, Advocates. Defamatory statement published in a newspaper - Prosecution can be launched against accused at any place of circulation of newspaper. Indian Penal Code, Section 500 - Criminal Procedure Code, Sections 179, 177, 178 and 200 - Defamatory statement published in a newspaper - Prosecution can be launched against accused at any place of circulation of newspaper. (i) Consequences of Publication ensue in places of circulation of newspaper - Prosecution can be launched in Courts exercising jurisdiction over any one of the places wherein such circulation is made. (2) The fact that publisher of newspaper was not made party is not relevant. A. Vinayagam v. Subash Chandra, 2000(1) LW (Cri) 460. Amar Nath v. State of Haryana,(1977)4 SCC 137 : AIR 1977 SC 2185. Ashish Nandy v. State of Gujarat, 2010(7) R.C.R. (Criminal) 1560 : 2010 DHC 1328. Subramaniam Swamy v. Prabhakar, 1984 Cri.L.J. 1329. M. Jevanandham v. Balaji, 2008(2) R.C.R. (Criminal) 619 : 2007 (1) MLJ 960 (Cri) : 2007 Cri.L.J. 2621. Madhya Pradesh v. Suresh Kaushal, 2002(1) R.C.R. (Criminal) 766 : 2003 (11) SCC 126 : 2001 AIR SCW 4587. S. Bangarappa v. Ganesh Narayan Hegde, 1984 Cri. L.J. 1618. Shaukatali Ibrahim Rangrez v. Mohommad Siraj, 1997 Cri. L.J. 1352. P.R. Shivakumar, J. - This criminal revision case is directed against the order of the learned XVIII Metropolitan Magistrate, Saidapet, Chennai dated 12-7-2010 holding that the said Court did not have the jurisdiction to entertain the complaint preferred by the petitioners herein under Section 200, Cr. P.C. against the respondent herein for an alleged offence of defamation punishable under Section 500, IPC and returning the same for the said reason. 2. Notice before admission was served on the respondent and the respondent has also entered appearance through counsel. 3. The arguments advanced by Mr. I. Subramaniam, learned Senior Counsel representing the counsel for the petitioner and by Mr. Amit Desai, representing the learned counsel for the respondent were heard. 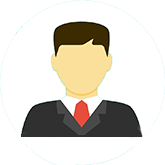 Subhiksha Trading Services Ltd., the first petitioner is a Company incorporated under the provisions of the Companies Act. It is represented by its Managing Director R. Subramanian, who also figures as the second petitioner. The respondent herein is the Chairman of M/s. Wipro Technologies Ltd., a company having its office in Doddakannalli Village, Sarjapur Road, Bangalore. Through a company controlled by him, the respondent purchased 10% of the equity shares of Subhiksha Trading Services Ltd., the first petitioner-Company. The respondent also extended some loans to the first petitioner company through another company controlled by him. The first petitioner-company and the companies controlled by the respondent do have certain disputes relating to the merger of the first petitioner-company with another company as well as regarding the reorganization of the debt of the first petitioner-company and they are pending before the relevant Courts. ".....Subhiksha was an error. You may see more visibility on it going forward, let's wait till then, Subhiksha was unfortunate. I think it's a retail equivalent of Satyam. I think the media has completely ignored it, it's a very interesting minefield for you. It's an out and out fraud, there's no question on it. The Company Law Board is investigating it. There was an overstatement of accounts, fake inventory, fake bills, fake companies that money was transferred to. At the time of investment that was not visible to us." 6. Alleging that the respondent herein deliberately made such a false statement, knowing fully well that there was no truth in it with an intention of defaming the petitioners and thwarting the petitioners' restructuring efforts in the proceedings pending before the High Court, Madras, the petitioners contended in their complaint that the respondent should be prosecuted for the offence of defamation punishable under Section 500, IPC and punished accordingly. 7. The learned XVIII Metropolitan Magistrate (Presiding Officer of the Court below), holding that the cause of action for prosecuting the respondent for the publication of the alleged defamatory statement did not arise within the territorial jurisdiction of the Court below and that the Court below did not have the jurisdiction to entertain the complaint, returned the complaint after passing an order to that effect on 12-7-2010 without issuing process to the respondent herein, who was shown as the sole accused in the complaint. In fact, the learned XVIII Metropolitan Magistrate held an enquiry regarding the maintainability of the complaint on the point of jurisdiction without even recording the sworn statement of the complainants and in such an enquiry, the petitioners herein also submitted their written submissions on the issue of jurisdiction. As per Section 179 of Cr. P.C. when an act is punishable as an offence and such act is committed within the jurisdiction of one Court and the consequences of the said Act ensued within the jurisdiction of another Court, both the Courts shall have jurisdiction to try the offence and the said offence shall be tried by any one of the said Courts was the contention raised therein. It was also contended that the place wherein words were uttered by the respondents was not known to the complainant since the article published in the newspaper did have no reference to wherein the interview was conducted; that since the interview in which the statement containing imputations was given to a newspaper to be published in its edition that was meant to be read by public and the interview was in fact published in such newspaper in its print and internet edition, any one of the Courts having jurisdiction over any area where the article could have been read as the said place would be the place where the consequences of the Act of making the defamatory statements ensued could entertain the complaint and try the case; that therefore, the consequences of making defamatory statements against the petitioners intended to be published in the said newspaper had ensued within the jurisdiction of the Court below, namely the Court of XVIII Metropolitan Magistrate, Saida pet, Chennai and that hence the said Court was vested with the jurisdiction to entertain the complaint and try the case. (IV) The complainants have failed to prove that consequences had ensued within the jurisdiction of the Court below. 9. The legality and sustainability of the said order are questioned in the present criminal revision case. 10. It is the contention of the learned senior counsel for the petitioners that the order of the learned XVIII Metropolitan Magistrate, Saidapet, Chennai, holding that his Court did not have the jurisdiction to entertain the complaint for the offence of defamation allegedly committed by the respondent herein cannot be sustained in law; that the Court below, without even recording the sworn statement of the complainant and without properly considering the allegations that the statements containing imputations made by the respondent in the interview to the Economic Times Newspaper, which was published in the print and internent editions of the said newspaper on 11-3-2010 in its Chennai Edition and other edition, erroneously held that it had no jurisdiction to entertain the complaint; that the Court below chose to give a finding without a trial that the publication of the alleged defamatory materials within the jurisdiction of the Court below, namely within Madras City, was not proved by the petitioners herein/complainants, without even conducting a trial and that the said finding rendered by the Court below shall be legally unsustainable. 11. On the contrary, the learned counsel for the respondent submitted that though the complainant in the complaint alleged that the interview was published in the newspaper "Economic Time" on 11-3-2010 in its Chennai edition, only the Mumbai edition was annexed to the complaint; that the grounds raised in the revision petition are devoid of merits and liable to be rejected; that the comments allegedly made by the respondent and published in the Economic Times on 11-3-2010 were not per se defamatory as contended by the petitioners/complainants and hence the complaint itself was not maintainable; that no cause of action for the complaint arose within Chennai or within the jurisdiction of the Court of the learned XVIII Metropolitan Magistrate, Saidapet, Chennai; that the petitioners having chosen to initiate criminal proceedings for the publication of the alleged defamatory statement within the jurisdiction of the Court of the learned XVIII Metropolitan Magistrate, Saidapet, Chennai, ought to have made the publisher also an accused and since the publisher had not been made an accused nor had he been shown as a witness in the list of witnesses, the order of the XVIII Metropolitan Magistrate returning the compliant on the ground that the Court of XVIII Metropolitan Magistrate did not have the jurisdiction to entertain the complaint deserved no interference, as there was no defect or infirmity in such order and that by the complaint, the petitioners had sought to initiate frivolous and vexatious proceedings against the respondent, which would amount to an abuse of process of law and hence, the present criminal revision case should be dismissed. 12. This Court paid its anxious considerations to the submissions made on either side. 13. The short point that arises for consideration in this criminal revision case is whether the order of the Court below holding that it does not have territorial jurisdiction to entertain the complaint of the petitioners and returning the complaint for that reason, can be sustained in law. The offence of defamation is defined under Section 499, IPC and the punishment for the same is prescribed under Section 500, IPC. In the language of 499, IPC, whoever, by words either spoken or intended to be read, or by signs or by visible representations, makes or publishes any imputation concerning, any person intending to harm or knowing or having reason to believe that such imputation will harm, the reputation of such person, is said to defame that person unless the said imputation falls within any one of the 10 exceptions provided therein. Explanation 2 to the main provision of Section 499 provides that an imputation concerning a company or an association or collection of persons as such, may also amount to defamation. "Subhiksha was an error. You may see more visibility on it going forward, let's wait till then, Subhiksha was unfortunate. I think it's a retail equivalent of Satyam. I think the media has completely ignored it, it's a very interesting minefield for you. It's an out and out fraud, there's no question on it. The Company Law Board is investigating it. There was an overstatement of accounts, fake inventory, fake bills, fake companies that money was transferred to. At the time of investment that was not visible to us." 15. Besides making the above said averments in the complaint, it has also been averred in the complaint that the said statement made by the respondent in the interview with the reporter of Economic Times was published not only in Chennai, but also in other editions; that though the statement was made by the respondent at a place, which is not obvious from the report, the same was read by the public all over the country including Chennai within the jurisdiction of the Court below and that hence the complaint was preferred on the file of the Court below, namely the Court of the learned XVIII Metropolitan Magistrate, Saida pet, Chennai. The gist of the Averments regarding the jurisdictional fact, made by the petitioners, is that though the interview was given by the respondent at a place, which does not come under the territorial jurisdiction of the Court below, since the statement was published in Chennai and thus the consequences of the Act committed by the respondent ensued, in Chennai within the jurisdiction of the Court below, it has got jurisdiction to entertain the complaint. 16. On the other hand, it is contended on behalf of the respondent that since the publication of the interview is projected to be the consequence of the respondent's act of giving an interview to the reporter of the newspaper Economic Times, the editor/publisher of the newspaper also should have been made an accused and that since the editor/publisher has not been made an accused, the attempt to prosecute the respondent in the Court below should be construed to be an attempt to prosecute him in a Court, which does not have the jurisdiction to try the offence. 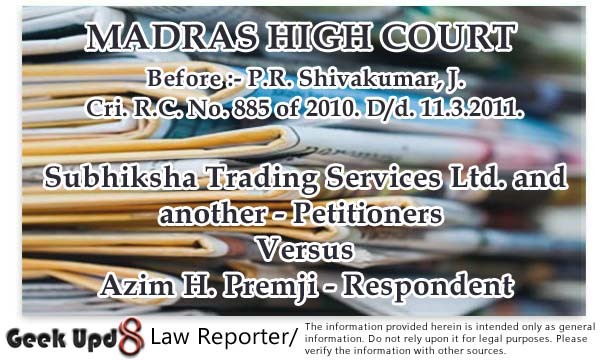 It is also the contention of the learned counsel for the respondent that though the complaint contains an averment to the effect that the statements made by the respondent in the interview given to the reporter of Economic Times was published in the print and internet editions of the said newspaper on 11-3-2010 in Chennai edition apart from the other editions across the country, the petitioners chose to annex only the Mumbai edition of the said newspaper along with the complaint and for that reason also, the order of the Court below holding that it does not have jurisdiction to try the case should be upheld. 17. Apart from these two contentions, which alone are germane to the issue involved in this criminal case, the respondent has chosen to raise several contentions which are not germane for the issue involved in the criminal revision case. They are touching the merits of the case, which cannot be considered at this stage and hence, this Court prefers to avoid any reference and discussions in respect of other contentions of the respondent. Suffice to consider the contentions raised on both sides regarding the question of jurisdiction of the trial Court, which alone was decided by the trial Court, resulting in the return of the complaint, as the trial Court held that it had no territorial jurisdiction to entertain the complaint. But it is not the case of the petitioners that the complaint is maintainable in the Court below simply because, the address of the petitioners fall within its territorial jurisdiction. Clear averments have been made to the effect that the consequences of the act of the respondent ensued within the territorial jurisdiction of the Court below. The second reason assigned is that the address of the accused, namely the respondent herein, does not come under the territorial jurisdiction of the Court below, as the second respondent is said to be residing at Doddakannalli Village, Sarjapur Road, Bangalore, which is in Karnataka State. The said observation is irrelevant, since the residence of the accused or the place of business of the accused is not sought to be projected as a jurisdictional fact. The Court below has also made an observation that it has got no jurisdiction, since neither the complainant nor the accused have got their business or residential address within the territorial jurisdiction of the said Court. 19. Section 177 of the Code of Criminal Procedure is to the effect that every offence shall originally be inquired into and tried by a Court within whose jurisdiction it was committed. But Section 178 provides for the selection of place of enquiry or trial under certain contigencies. According to Section 178 when it is uncertain in which of several local areas an offence was committed, or b) where an offence committed partly in one local area and partly in another, or c) where an offence is a continuing one and continues to be committed in more local areas than one, or d) where the offence consists of several acts done in different local areas the offence may be inquired into or tried by a Court having jurisdiction over any of such local areas. 20. Section 179, Cr. P.C. deals with the place of trial of an offence when an act shall be an offence by reason of anything which has been done and of a consequence which has ensued. In such cases, the offence may be in quired into or tried by a Court within whose jurisdiction the act was done or its consequence has ensued. 21. The subsequent sections, namely Sections 180 to 184 deal with certain specified acts amounting to offences by reason of their relation to other offences, offences committed by letters, offences committed on voyage or journey and place of trial when offences are tried together. Those provision are not relevant in this case. 22. Section 179, Cr. P.C. is the appropriate provision dealing with the question of jurisdiction in this case. According to the complaint, the act of giving interview to the reporter of the newspaper Economic Times was given somewhere else, but the defamatory statement made by the respondent was published in various places across the country including the areas within Chennai, which come under the jurisdiction of the Court below and thus the consequences of the act of the respondent in making the statement containing imputations ensued at a place within the jurisdiction of the Court below. Clear averments have been made in the complaint to the effect that the statement made by the respondent in the interview were published in the print and internet editions of the newspaper Economic Times on 11-3-2010 in its Chennai edition and also in its other editions across the country. It has been clearly averred that the publication was made in the Chennai edition of Economic Times, which does have circulation in the entire city of Chennai, including the areas that come under the territorial jurisdiction of the Court below and hence the condition regarding pleading of necessary jurisdictional fact should be held to have been complied with by the petitioners (complainants). The interview published in 11-3-2010 edition of Economic Times is listed as Document No. 7 in the list of documents annexed to the complaint. In this regard, the learned counsel for the respondent raised a contention that no proof of publication in Chennai, much less in any area within the jurisdiction of the Court below, was produced along with the complaint; that the copy of the newspaper annexed to the complaint was a copy of the Mumbai edition of Economic Times dated 11-3-2010 and that, hence the order of the Court below negativing its jurisdiction to entertain the complaint should be upheld. 23. This Court is at a loss to understand the basis on which such a contention was raised by the learned counsel for the respondent. Before issuing process, the complaint was returned by the Court below. Therefore, the respondent could not have been served with a copy of the complaint or the enclosures, by the Court below. Since this Court chose to direct issuance of a notice in the criminal revision case, the respondent could have got copies of the documents relied on by the petitioners. The original complaint and the order passed by the Court below have been enclosed with the grounds of criminal revision case. In the typed-set of papers filed by the petitioners, copy of the complaint in the unnumbered calendar case, copy of the written submissions made by the complainants on the issue of jurisdiction and copy of the order passed by the Court below alone have been included. Only in the additional typed set, a xerox copy of the Mumbai edition of Economic Times dated 11-3-2010 containing the statements made by the respondent in the interview to the reporter of the said newspaper has been included. Only on seeing the same, the respondent should have jumped to the conclusion that the document referred to as Item 7 of the list of documents annexed to the complaint, Mumbai edition of Economic Times alone was referred to. However, the learned senior counsel for the petitioners would submit that the petitioner was having in his possession both the Mumbai and Chennai editions of Economic Times newspaper dated 11-3-2010 and while preparing the additional typed-set of papers, the learned counsel for the petitioners by inadvertence included the xerox copy of the Mumbai edition in it and that the same alone will not be enough to hold that the document referred to as Document No. 7 in the list of documents annexed to the complaint is the Mumbai Edition of Economic Times dated 11-3-2010 alone. In addition to the same, the petitioners have also produced a Chennai edition of the Economic Times dated 11-3-2010 containing the statements made by the respondent in his interview to Economic Times. 24. In the light of the above said fact, this Court comes to the conclusion that the contention raised on behalf of the respondent that the petitioners were not able to produce prima facie materials regarding the publication of the alleged defamatory statement within the jurisdiction of the Court below deserves to be rejected as untenable. Since the petitioners have produced the Chennai edition of Economic Times also, it cannot be now contended that no prima facie material has been produced to show that the publication of the interview given by the respondent to Economic Times was also made in Chennai. "The above Section contemplates two Courts having jurisdiction and the trial is permitted to take place in any one of those two Courts. One is the Court within whose local jurisdiction the act has been done and the other is the Court within whose local jurisdiction the consequence has ensued. When the allegation is that the miscarriage took place at Jabalpur, it cannot be contended that the Court at Jabalpur could not have acquired jurisdiction as the acts alleged against the accused took place at Indore. 26. In Shaukatali Ibrahim Rangrez v. Mohommad Siraj, reported in 1997 Cri. LJ 1352, a learned single Judge of Bombay High Court (Aurangabad Bench) held that if a defamatory utterance is made at one place and the complainant is defamed at another place where he was residing, the Court exercising over that place will also have a jurisdiction to try the offence. 27. In S. Bangarappa v. Ganesh Narayan Hegde, reported in 1984 Cri.L.J. 1618, Karnataka High Court held where the alleged defamatory statement was made by the accused in the press conference at place 'B' and the same was published in the evening newspaper "Sanje Vani" on the same day at 'B' and in the daily newspaper "Samyukta Karnataka" in the early hours of the very next day at place "H", it should be held that the Court at that place had the jurisdiction to try the offence of defamation. It was held therein that once the consequence of publication has taken place at a place, it could not be said that the Court at that place had no jurisdiction to try the said offence. 28. Relying on the said judgment of the Karnataka High Court, the Mumbai High Court in the above said case (Shaukatali Case) held that since consequences of the utterances resulted in the defamation of the complainant and prevention of his sons marriage at the place other than the place wherein the utterances were made, the second place, namely the place wherein it resulted in his defamation and prevention of his son's marriage, should be construed to be the place wherein the consequence of the defamatory utterances ensued and the Court having jurisdiction over that place would be competent to entertain the complaint. 29. The Delhi High Court also in Dr. Ashish Nandy v. State of Gujarat, reported in 2010(7) R.C.R. (Criminal) 1560 : 2010 DHC 1328, referring to the observations made by the Supreme Court in State of M.P. v. Suresh Kaushal, reported in 2003 (11) SCC 126 : (2001 AIR SCW 4587) held that when an article was written in Delhi and handed over to a newspaper in Delhi, it would amount to defamation committed in Gujarat, if such newspaper was proved to be in circulation in Gujarat or that any one in Gujarat could have read that article. The Court made an observation therein that a person sitting in a studio in Delhi might make an inflammatory speech on television or he might give an article for publication to a newspaper having all India circulation, but if the consequence of such speech or the article were visited at a distant place or in another State, registration of the FIR in such a place or in such a State was not without jurisdiction. "Now it has been admitted that a part of the act is done by the petitioner-accused at Chandigarh, namely, addressing a press conference and intending that all the reporters, press representatives and others should publish his views and news in the press throughout India. Calling a press conference by the petitioner is not seriously disputed. The very purpose and design to call a press conference is to express one's views before press representatives with an object that it will be given the widest publicity by the press so that a large number of people and readers should read it and know about his views and his thoughts. The Indian Express in which the impugned news item is published is circulated and read in the City of Bombay where the complainant resides. In my view, the consequence of the statement made at Chandigarh has been completed at Bombay by circulation of the said newspapers, and, therefore, the offence of defamation is complete in the City of Bombay. In view of the provisions of Section 179 of the Criminal Procedure Code both the Courts, at Chandigarh and at Bombay, will have jurisdiction to entertain a complaint under Section 500 of the Indian Penal Code. It is, therefore, this petition deserves to be dismissed. 31. The facts of the said case squarely applies to the case on hand. The respondent is said to have given an interview to the Newspaper "Economic Times" intending it to be published and to be read by public. Therefore, though the act of making the defamatory statement during the interview was done at a place outside the jurisdiction of the Court below, it has been alleged that its consequence of defaming the petitioners herein ensued within the jurisdiction of the Court below, as the said newspaper was found circulated in Chennai, besides the fact that the Newspaper does have a Chennai edition also. It has also been clearly averred the fact that not only in the print but also in the internet edition interview was published. In addition to the same, when a publication is made in the internet edition of a newspaper, anybody at a remote place in the country, at the stroke of a button, may come across the statement and form opinion against the petitioner. In that sense also, the petitioners have made clear averments regarding the jurisdictional fact to the effect that the publication was effected within the jurisdiction of the Court below and hence the Court below has jurisdiction to entertain the complaint. Without properly considering the above said aspect that in the case of an interview to press, though the act of giving interview takes place at one place, its consequences ensue in the places of circulation of the newspaper and hence a prosecution for such statement, if defamatory, can be launched in the Courts exercising jurisdiction over any one of the places wherein such circulation is made, the learned XVIII Metropolitan Magistrate, erroneously held that his Court did not have the jurisdiction to entertain the complaint. The said finding of the Court below deserves to be disapproved. 32. The next reason assigned by the Court below for holding that it does not have jurisdiction to entertain the complaint is that the publisher of the newspaper was not made a party/accused. It is not necessary that the publisher should also be made a co-accused for prosecuting an author of the statement. If at all a statement was made to any person, another person without any intention and without the knowledge that it would be published and such other person publishes it, then there may be a scope for the author of the statement to take such a defence, but the same can be decided only in the trial. But, when an interview to the press is given, it shall be obvious that the person giving the interview intends that it should be published or at least has got knowledge that it is going to be published. In that sense, making of an interview to the media results in the consequence of publication in the places wherein the news- paper is circulated. Therefore, for the consequence of the alleged act of the respondent that ensued within the jurisdiction of the Court below, he can be tried in the Court below and the decision of the Court below that it does not have jurisdiction because the publisher was not made a party accused, is erroneous and legally unsustainable. 33. Yet another objection, a technical one has been raised by the learned senior counsel for the respondent. According to him, the impugned order passed by the Court below being an interlocutory order not disposing of the case finally, no revision against the same will lie. Pointing out the fact that the complaint was not dismissed and it was only returned for presentation before the Magistrate having jurisdiction, the said order would be construed only as an interlocutory order the learned counsel for the respondent contends that the present revision is not competent. I. He has to examine the complainant and his witnesses, if any. II. After such examination, he may post- pone, the issuance of process by inquiring into the case by himself or directing an investigation to be made by a police officer. III. If the Magistrate is convinced after the examination of the complainant or as the case may be his witnesses, he may decided to issue the process. IV. He may straightway decide to dismiss the complaint, after such an exercise of examination of the complainant and the witnesses. 15. Law does not know to provide any other mode of dealing with the complaint. much less returning the complaint. It is not possible for a Magistrate to return the complaint for the so-called defects and if the defects are there in the complaint, the complainant has to suffer. There is no warrant in the Criminal Procedure Code or the Criminal Rules of Practice, empowering the Magistrate to return the complaint just because he thinks that there are any defects. In this behalf, the observation by both the learned Judges that the Magistrate has a power to return the complaint because he has a power to accept is clearly incorrect. In the first place, the Magistrate does not have a "power" to accept the complainant. That is not the power of the Court. That is the "duty" on the part of the Court in contradistinction to its "powers". Again, unless there is a specific provision in the Code or the rules, the Magistrate cannot find out his own procedure by returning the complaint as it is. In fact, when the complainant presents the case to the Magistrate that is not the stage of examining the defects and it is not the Magistrate to examine the so called defects in the complaint. All that the Magistrate has to do is to consider the same by ordering the examination of complainant and/or as the case may be, his witnesses. It was strenuously suggested that if there are some formal defects like the age is not stated or the name of the father of the accused is not stated, the complainant should get a fair chance to correct the defects. We only observe that it is for the complainant to produce a defect less complainant, if because of such defects, such as non-mentioning of the age and names of the father, etc., the identity of the accused person becomes suspicious or is not established properly then, the complainant must suffer for his defective complaint, but, under no circumstances, could the Magistrate return the complaint, particularly after the Court-seal has been put on that complaint and the Court-fees stamps have been cancelled then, as rightly found by Janarthanam, J., the complaint becomes the Court property. "The learned Chief Judicial Magistrate ought not to have returned the complaint by making certain endorsement without following the procedure contemplated under Sections 201, 202 and 203 of the Criminal Procedure Code. Therefore, this Court is constrained to direct the learned Chief Judicial Magistrate, Chengalpet, to take the complaint on file and to proceed to deal with the complaint in accordance with law by following the procedures contemplated under Sections 201, 202 and 203 of the Criminal Procedure Code." Pointing out fact that the said order was passed by the learned single Judge exercising the inherent power of the High Court under Section 482, Cr. P. C., the learned senior counsel for the petitioners would contend that even if it is assumed that the order passed by the Court below can be construed to be an interlocutory one, such order can be set aside using the inherent powers of the High Court. "As pointed out in Amar Nath's case (supra), the purpose of putting a bar on the power of revision in relation to any interlocutory order passed in an appeal, inquiry, trial or other proceeding, is to bring about expeditious disposal of the cases finally. More often than not, the revisional power of the High Court was resorted to in relation to interlocutory orders delaying the final disposal of the proceedings. The Legislature in its wisdom decided to check this delay by introducing sub-section (2) in Section 397. On the one hand, a bar has been put in the way of the High Court (as also of the Sessions Judge) for exercise of the revisional power in relation to any interlocutory order, on the other, the power has been conferred in almost the same terms as it was in the 1898 Code. On a plain reading of section 482, however, it would follow that nothing in the Code, which would include sub- section (2) of Section 397 also, "shall be deemed to limit or affect the inherent powers of the High Court". But if we were to say that the said bar is not to operate in the exercise of the inherent power at all, it will be setting at naught one of the limitations imposed upon the exercise of the revisional powers. In such a situation, what is the harmonious way out? In our opinion, a happy solution of this problem would be to say that the bar provided in sub-section (2) of Section 397 operates only in exercise of the revisional power of the High Court, meaning thereby that the High Court will have no power of revision in relation to any interlocutory order. Then in accordance with one of the other principles enunciated above, the inherent power will come into play, there being no other provision in the Code for the redress of the grievance of the aggrieved party. But then, if the order assailed is pruely of an interlocutory character which could be corrected in exercise of the revisional power of the High Court under the 1898 Code, the High Court will refuse to exercise its inherent power. But in case the impugned order clearly brings about a situation which is an abuse of the process of the Court or for the purpose of securing the ends of justice interference by the High Court is absolutely necessary, then nothing contained in Section 397(2) can limit or affect the exercise of the inherent power by the High Court. But such cases would be few and far between. The High Court must exercise the inherent power very sparingly. One such case would be the desirability of the quashing of a criminal proceeding initiated illegally, vexatiously or as being without jurisdiction. Take for example a case where a prosecution is launched under the Prevention of Corruption Act without a sanction, then the trial of the accused will be without jurisdiction and even after his acquittal a second trial, after proper sanction will not be barred on the doctrine of autrefois acquit. Even assuming, although we shall presently show that it is not so, that in such a case an order of the Court taking cognizance or issuing processes is an interlocutory order, does it stand to reason to say that inherent power of the High Court cannot be exercised for stopping the criminal proceeding as early as possible, instead of harassing the accused up to the end? The answer is obvious that the bar will not operate, to prevent the abuse of process of the Court and/or to secure the ends of justice. The label of the petition filed by the aggrieved party is immaterial. The High Court can examine the matter in an appropriate case under its inherent powers. The present case undoubtedly falls for exercise of the power of the High Court in accordance with Section 482 of the 1973 Code, even assuming, although not accepting, that invoking the revisional power of the High Court is impermissible." 37. The said larger Bench of the Hon'ble Supreme Court held that an order taking cognizance or issuing process cannot be said to be an interlocutory order. The large Bench of the Hon'ble Supreme Court is of the view that the inherent power of the High Court under Section 482, Cr. P. C. is not controlled by Section 397(2). At the same time it has also observed that normally the bar provided under Section 397(2) will rule out the exercise of the inherent power under Section 482, since the said power is to be separately used with circumspection for the purpose of avoiding miscarriage of justice and preventing abuse of process of Court. The Hon'ble Apex Court also expressed the view that the inherent power can be exercised even in cases of interlocutory order for the purpose of preventing miscarriage of justice and to check abuse of process of Court. Though the order of the Court below is challenged by filing a revision, no form or procedure is contemplated in the Code of Criminal Procedure for invoking the inherent power of the High Court and in appropriate cases, the inherent power of the High Court can be exercised even in a case filed as a revision against an order of the Court below. 38. For all the reasons stated above, this Court comes to the conclusion that the revision succeeds and the order of the Court be- low dated 12-7-2010 is liable to be set aside. 39. In the result, this criminal revision case is allowed and the order of the XVIII Metropolitan Magistrate Court, Saida pet, Chennai dated 12-7-2010 is set aside. The learned XVIII Metropolitan Magistrate is directed to take the complaint on file and dispose of the same in accordance with law. The original complaint along with the enclosures filed along with this revision shall be returned to the petitioners and the petitioners are given two weeks' time from the date of receipt of a copy of this order to re-present the complaint before the Court below.